On my way back from college, I found myself craving a hot cup of well-made coffee on a rather cold windy winter evening. Okay, so one thing about staying or studying in north campus (A part of Delhi University) is that, you find innumerable places to eat. They range from the local Cholla-Kulcha Waala, the small stalls serving hot steamed Momo’s to the fancy well lit up cafes at Hudson. But having stayed and studied here for over a year and a half I have come to realise that there are very few places which serve you good coffee. The obvious exceptions being Costa Coffee or Barista. However, these big coffee shops fail to qualify as your daily dose of ‘chai’ or ‘coffee’ since you’re living on a student budget and are perpetually trying to save money. So, I went on a quest to find a place where I would get a piping hot cup of well-made coffee. To my rescue came, ‘Raju Coffee Waala’ who is interchangeably known as ‘Raju Maggie Waala’. Situated on the Chatra Marg, right outside the Law Faculty, Raju makes the best coffee I’ve had in North Campus. 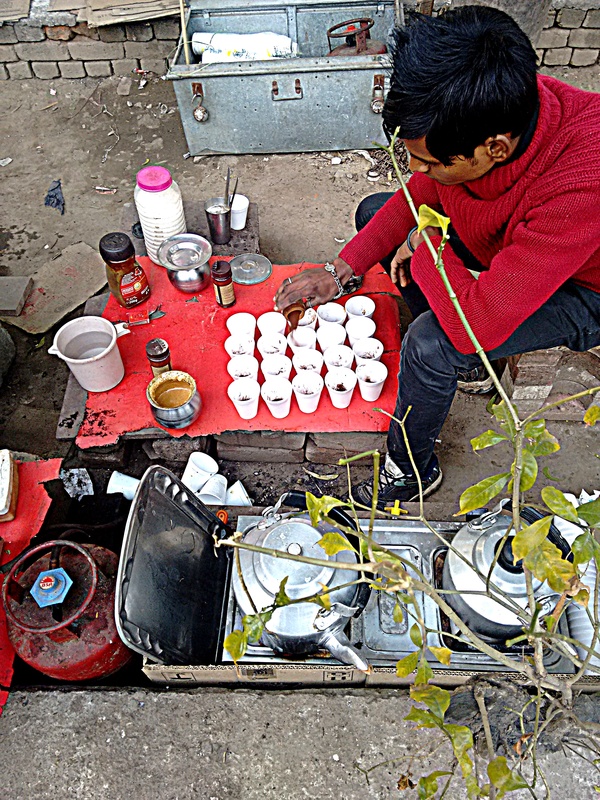 What sets Raju apart from the various other chai/coffee stalls is the fact that his coffee is hand beaten. This is the reason behind his coffee being Frothy, Light and Flavorsome. In addition to this, he sprinkles some coffee powder on the top to give it that extra kick, making his coffee the best in the neighbourhood. Raju Suri or Raju Bhaiya understands the relevance of marketing and in an attempt to increase his sales, he has devised an addition to his normal cup of coffee i.e. a cup of ‘light coffee’, for those who love having their daily dose of coffee but don’t like it strong. So, the next time you’re wandering the streets of Kamla Nagar /aimlessly driving by this beautiful university road or walking back from a tiresome day at college. Be sure to stop and pick up a cup of piping hot coffee at Raju Coffee Waala.